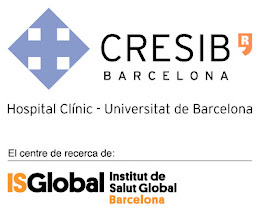 Address: Centre de Recerca en Salut Internacional de Barcelona (CRESIB), Hospital Clínic. Rossello 132, 4ª. Barcelona, 08036 Spain. PhD “Potential New Therapeutic Agents: Effects on HIV Replication and Viral Escape”. PhD supervisor : José A. Esté, PhD. M. Sc. in Immunology, Universitat Autònoma de Barcelona (Spain), 2006. B. Sc. in Biology, Universitat de Barcelona (Spain), 2004. Oct 12 International Good Clinical Practice. Whitehall training. April 09 Introduction to Good Clinical Practice (GCP). Vienna School of Clinical Research. May 05 Flow Cytometry Course. Hospital Universitari Germans Trias i Pujol (Barcelona, Spain). Sep 04 1st Course on Medicinal Chemistry. Institut Químic de Sarrià and Universitat Ramon Llull (Barcelona, Spain). Jul 00-Aug 00 The cultural revolution of biomolecules. Universitat de Barcelona Summer Courses (Els Juliols de la UB). Faculty of Pharmacy, Universitat de Barcelona (Barcelona, Spain). Jul 00-Aug 00 Neurodegenerative disease: from the lab to the hospital. Universitat de Barcelona Summer Courses (Els Juliols de la UB). Biochemistry and Molecular Biology Department, Universitat de Barcelona (Barcelona, Spain). Jul 99 Initiation to the Biochemistry and Molecular Biology. Biochemistry and Molecular Biology Department, Universitat de Barcelona and Sociedad Española de Bioquímica y Biología Molecular (Barcelona, Spain). Sep 04-Dec 08 PhD student at Fundació IrsiCaixa (Institut de Recerca de la SIDA de “la Caixa”) Retrovirology Laboratory, Hospital Universitari Germans Trias i Pujol, Badalona (Barcelona, Spain). Research project: Molecular mechanisms of HIV entry and HIV pathology. Development of new antiviral compounds. Supervisor: Dr. José A. Esté. Feb 04-Jun 04 Training student at the Laboratory of medical virology Centre Nacional de Enterovirus de Lyon, Université Claude Bernard Lyon I (Lyon, France). Research project: Cell entry pathway and haemagglutination of echovirus 6 strains derived from clinical isolates. Supervisor: Prof. Bruno Lina and Dr. Nicolas Lévêque. Jun 03-Dec 03 Training student at the Immunology and Infectious Diseases Department, Hospital Clínic de Barcelona (Barcelona, Spain). Research project: Generation of HIV neutralizing monoclonal antibodies from HIV patients after HAART interruption. Supervisor: Dr. Teresa Gallart and Dr. Núria Climent. Apr 02-Oct 02 Training student at the Metabolic engineering and diabetes therapy group, Intitut de Recerca Biomèdica (Barcelona, Spain). Research project: Regulation of hepatic and muscular glycogen metabolism. Alterations in pathological conditions, diabetes mellitus. Supervisor: Prof. Joan Guinovart. Jun 00-Sep 00 Training student at the Metabolic engineering and diabetes therapy group, Biochemistry and Molecular Biology Department. Universitat de Barcelona (Barcelona, Spain). Research project: Regulation of hepatic and muscular glycogen metabolism. Alterations in pathological conditions, diabetes mellitus. Supervisor: Prof. Joan Guinovart. Jan 10- Dec 13 Postdoctoral fellowship: Contrato Posdoctoral de Perfeccionamiento Sara Borrell, Instituto de Salud Carlos III (Spain). Jan 05-Dec 08 PhD fellowship, Departament d’Universitats Recerca i Societat de la Informació (DURSI), Generalitat de Catalunya (Spain). May 07 2nd award graduate student poster category at 20th ICAR, International Conference on Antiviral Research (Palmsprings, USA). Sep 04-Jan 05 PhD fellowship, Irsicaixa (Barcelona, Spain). Jun 03-Dec 03 Final year of BSc Collaboration Fellowship from the University of Barcelona at the Immunology and Infectious Diseases Department. Hospital Clínic de Barcelona (Barcelona, Spain). Sep 02-Jun 03 ERASMUS Exchange Student Fellowship at the University of Bangor (Bangor, UK). 7th European Congress on Tropical Medicine (ECTMIH). Moncunill G., Berthoud T., Mayor A., Romagosa C., Serra-Casas E., Rovira-Vallbona E., Quelhas D., Sanz S., Bardají A., Ordi J., Menéndez C., Dobaño C. Cellular-mediated immune factors involved in placental malaria infection. Barcelona, Spain. October 3-6, 2011. Jornades de Virologia. Moncunill, G., Armand-Ugón M.,Pauls, E., Clotet, B. and Esté, JA. Resistència del VIH-1 a antagonistes de CCR5 mitjançant la selecció in vitro de variants que utilitzen CXCR4 (Oral Presentation). Barcelona (Spain). November 5, 2007. 20th ICAR, International Conference on Antiviral Research. Moncunill, G., Armand-Ugón, M., Clotet-Codina, I., Llano, A., Vrijbloed, J., Clotet, B., Esté, J.A. The CXCR4 Antagonist POL3026 is a Potent Inhibitor of Human Immunodeficiency Virus (Oral presentation). Palm Springs (USA). April 29-May 3, 2007. 20th ICAR, International Conference on Antiviral Research. Moncunill, G., Armand-Ugón M., Clotet, B. and Esté, J.A. HIV Coreceptor Switch Induced by Antagonism to CCR5 (Poster attendance). (2nd award graduate student category). Palm Springs (USA). April 29-May 3, 2007. 20th ICAR, International Conference on Antiviral Research. Senserrich, J., Pauls, E., Clotet-Codina, I., Armand-Ugón, M., Moncunill, G., Clotet, B. and Esté, J.A.HIV-1 Resistance to the Anti-HIV Activity of an shRNA Targeting Rev (Poster). Palm Springs (USA). April 29-May 3, 2007. Keystone Symposium: Molecular Mechanisms of HIV pathogenesis.Moncunill, G., Armand-Ugón, M., Pauls, E., Clotet, B. and Esté, J.A. HIV Coreceptor Switch Induced by Antagonism to CCR5 (Poster). Whistler (Canada). April 11-14, 2007. 14th CROI, Conference on Retroviruses and Opportunistic Infections. Moncunill, G., Armand-Ugón, M., Pauls, E., Clotet, B. and Esté, J.A. HIV Coreceptor Switch Induced by Antagonism to CCR5 (Poster attendance). Los Angeles (USA), February 25-28, 2007. 3rd IAS Conference on HIV Pathogenesis and Treatment. Moncunill G., Negredo E., Vilarrasa J., Clotet B., Esté J.A. Evaluation of the Anti-HIV Activity of Statins (Poster). Rio de Janeiro (Brasil), July 24-27 2005. Expertise in P3 biosafety laboratory work Most of the techniques described below were carried out in a high level biosafety lab (P3). Cell culture, including cell lines (adherent, non adherent) and primary cells (lymphocytes, monocytes, macrophages, dendritic cells). Cell separation (positive and negative magnetic immunoselection). Surface staining, intracellular staining (ICS). Cytokine multiplex kits (Bender MedSystems, CBA). FACSCalibur, LSR II, LSRFortessa and FACS CANTO II (Beckton-Dickinson). Luminex Cytokine and chemokine quantification in culture supernatants and plasma samples. Obtention and titration of viral stocks (HIV). Antiviral activity in cell lines and primary cells. Microplate replication, full-plate serial dilutions and reagent addition Robot. (Multimek AP96 Robot, Beckman). HIV-p24 antigen, cytokines, antibodies ELISAS. IFNγ and IL2 ELIspots. DNA and RNA extraction and purification. PCR, electrophoresis, digestion, cloning and sequencing (ABI PRISM® 3100-Avant Genetic Analyzer, Applied Biosystems). Generation of recombinant viruses. Transfection of DNA (Lipofectamine, CalPhos, Amaxa). Genotyping (Real Time PCR FRED probes, LighClycler Instrument, Roche). User-level knowledge (Word, Excel, Power Point, Acces, Visual Basic, SPSS, Endnote, Stata, Mendeley, GraphPad Prism). Data bases (GenBank, Los Alamos HIV Database, Pubmed). Bioinformatics (Sequencher, Gendoc, BioEdit, BLAST, ClustalW). Flow cytometry analysis software (FacsDiva, FCSexpress, FlowJo). Multimek AP96 Robot Software (Multimek Pro). ABI PRISM® 3100-Avant integrate data analysis tools.